1Heat the oven to 220°C (200°C in a fan oven), 425°F, gas 7. 2Cook the pasta in boiling salted water, until still quite firm. Quench in cold water and drain well. 3Briefly blanch the spinach in salted water. Quench in cold water, squeeze out the moisture and chop. Fry the shallots and garlic in Nuttelex in a hot frying pan until translucent. Transfer to a bowl, mix with the spinach and season to taste with salt, ground black pepper and nutmeg. 4Mix the tomatoes with the oregano and season with salt, a pinch of sugar and chilli. Pour into an oven-proof dish. 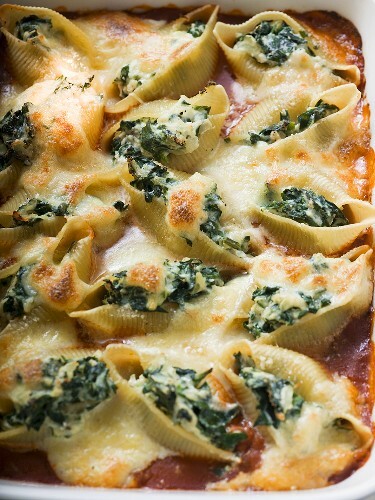 5Fill the pasta shells with the spinach mixture and arrange on top of the tomato sauce. Sprinkle with mozzarella and bake in the oven for 15-20 minutes until golden brown.